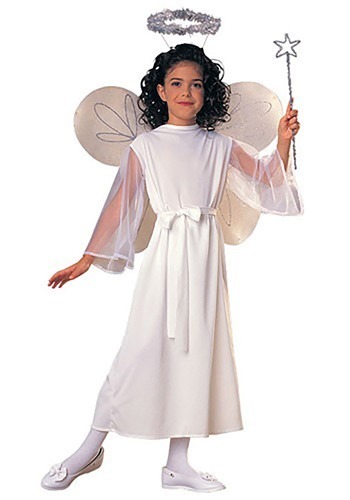 Turn your darling little girl into an adorable Earth Angel with this Girl’s Angel Costume! When she flutters from house to house this Halloween she will surely have a divine time. She will be a light in the darkness and brighten up the night for all your friends and neighbors. While other kids may enjoy dressing up as vampires, zombies, and other creatures of the night, your kiddo is a little different, isn’t she? She’s as pure as freshly fallen snow. There’s not a bad bone in her body, so why would she dress up as a frightening and villainous monster? It just doesn’t make sense to us. We think that this lovely Angel Costume will be a much better fit for your girl. Everyone will be saying holy moly when she enters the scene in this angelic outfit. The costume includes the elegant white dress with its mesh sleeves as well as the matching cloth belt and, of course, the shiny halo headband. If you’d like your adorable angel to have a pair of wings take a look through our accessories. You’ll surely be able to find her the perfect pair to complete this celestial transformation. Oh, and you could also add a fairy wand if you want to give the costume a storybook feel. Then again, your little girl can also be one of the mighty archangels if you grab her an awesome sword! Then her mission and purpose on earth would be to protect the planet and vanquish all evil. Boom, now she’s not only cute but fierce as well!